Out of my puncak, atas 10 Belle Moments. What is your favorit moments? Which Belle merchandise picture do anda think is prettier? Do anda own any Belle dolls? Do anda like the way Emilie de Ravin portrays Belle in tv-series "Once Upon a Time"? Can anda Please Take A Look At The forum Posts? Except Beast who do anda think Belle have the strongest relationship with in the Castle? How old do anda think Belle is? Why she is my favorit princess that she is smart, brave, kind, and beautiful. She has been my role model to me. When I was six I asked my mom what princess I was. She berkata Belle. I usually sat on the dipan, sofa every time and watch this beautiful movie. I learned to cinta to read from her. How she would go beyond the face and see he real person. Belle is my favorit disney female character and I thought that I would write this little artikel listing her outfits/dresses in the order that I like them. Why is she one of my favorites? And why does fan all over the world cinta her? The reason why I and many lebih like her is that she is in many ways relatable, she is seen as different in her halaman awal village and she dreams of better things in life much like most people at some point in their life. Belle is my favorit disney character and i figured she deserved an artikel so here it is. Belle is considerd oleh many to be the best disney princess for many different reasons like her beauty, her cinta for the Beast and much more, i like her just because she is beautiful and kind but she is not perfect, she has flaws and that makes her realistic. As I grow older I look back on the memories of my childhood. If you've ever cleaned your room and had a box of old junk, was there a special item anda just kept coming back to? a comment was made to the poll: Do anda own any Belle dolls? a comment was made to the poll: Belle atau Mulan? a comment was made to the poll: Belle atau Aurora? She is a french actress playing Belle in theater. 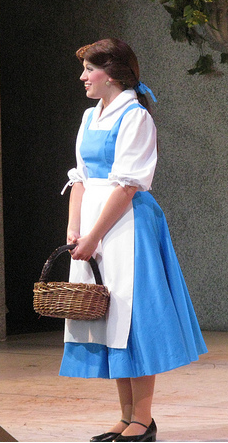 She is an actress playing Belle at Disney's Hollywood Studios. If anda could change one thing about Belle what whould thar be?